When I was a teenager, in the Summertime I used to work for my uncle Warren at Ripley's Believe it or Not in Cavendish. Everyday I would take route 224 through Wheatley River as a short cut to Cavendish. 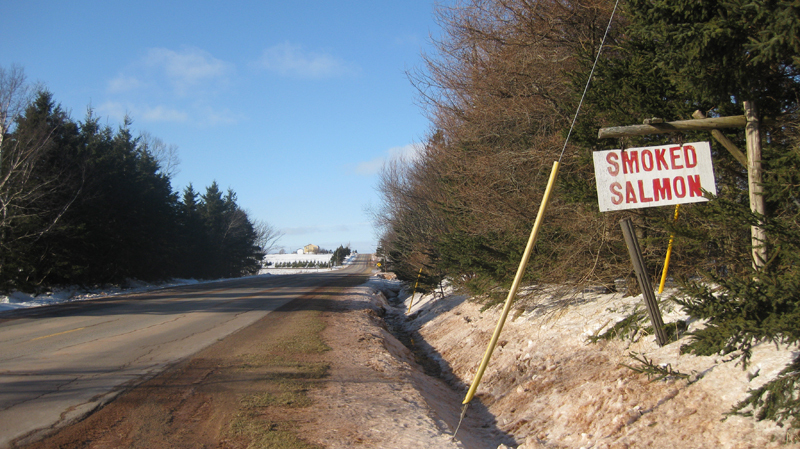 The New Glasgow Road or Route 224 would cut through Ebenezer which is a real tiny community North-East of Charlottetown. Everyday I would notice the sign on the right hand side of the road that said Smoked Salmon. Little did I know, years later I would be doing basic text updates to their website. But I have also taken a real liking to the Smoked Salmon fish product that they sell. While the price isn't exactly something you'd expect to find at Sobey's or Atlantic Superstore (1.5-1.8 lbs. for $50), it is actually a real quality product that I have come to really enjoy. On Friday, I had received a package of the smoked salmon fish and ended up dropping by the Co-op to pickup some bagels so I could put some of it on a bagel. Everyweek you can find Kim Dormaar at the Farmers Market doing the exact same thing, making and selling his $6 bagels which are absolutely incredible. I recall the first time I had ever had the Smoked Salmon fish from Kim Dormaar's. Years ago my mother prepared the smoked salmon by frying it on a frying pan. While her cooking is usually really good, the smoked salmon fried was extremely delicious. I ended up telling the office manager (Maggie) about this and she told me not to tell Kim (the owner) that we fried the smoked salmon! None the less, years later and the product is still fantastic!